A dessert with a rich custard base and a hard caramel topping, usually served in individual ramekins. A classic creme brulee - a perfect ending to any meal! 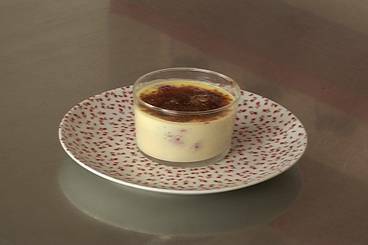 A classic vanilla scented crème brûlée cooked with red fruits and a crunchy caramel topping. The classic baked cream dessert with a tropical twist - crème brulée made with fresh mango. Crème onctueuse parfumée à la lavande et caramélisée après cuisson. A rich and creamy French classic flavoured with pistachio paste. A rich and creamy French classic flavoured with pistachio: a winning combination! A delicious set cream dessert made with fresh mint and served with macerated strawberries. 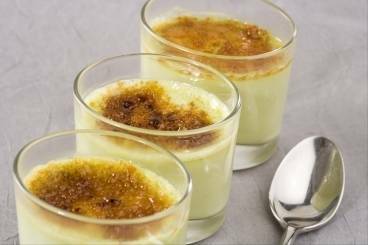 At first glance, this creme brulee may appear to be rich and a little over the top, but it is actually a lighter variation on the classic, and is a great way to end a lovely meal. 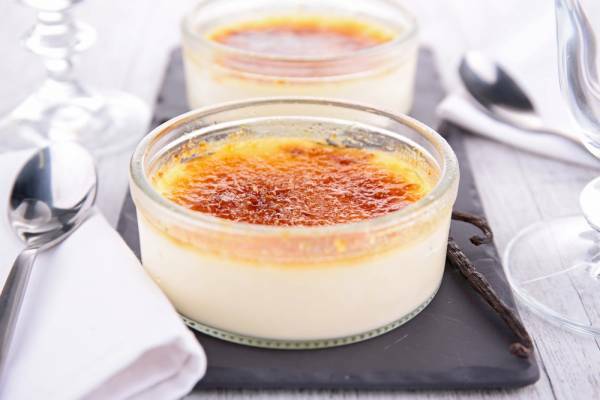 A classic vanilla crème brulee served in china spoons and finished with a caramelised sugar topping. A real classic - ginger scented creme brulee served in china spoons and finished with a caramelised sugar topping.